Do you need Urban Furniture advertising in Santa Cruz de Tenerife? On this page you will find the full offer of products, possibilities and prices for Urban Furniture advertising in Santa Cruz de Tenerife. 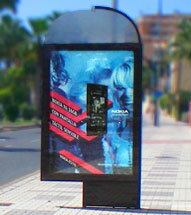 If you need to expand the coverage of your campaign or invest in Urban Furniture advertising in other places, you can use our search engine, which will help you quickly find all the advertising options in Santa Cruz de Tenerife and its province, not just in Urban Furniture, but also in other media and advertising displays you may be interested in using for your advertising campaigns.